Aphora at Marina San Pablo is located on the Intracoastal Waterway near the J. Turner Butler Boulevard as pictured in this rendering. Bove LLC and Remi Properties have announced the launch of Aphora at Marina San Pablo, a boutique collection of 57 residences. A dynamic retreat in the inviting community of Marina San Pablo, Aphora redefines waterfront living. The property’s modern and sophisticated style, from the stunning interiors to the lush rooftop oasis, captures a new level of curated luxury. Prices for the condominiums range from $600,000 to $2 million. Floor plans range in size from 2,500 square feet to 5,200 square feet. 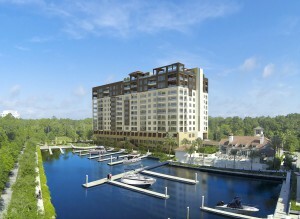 The planned 12-story tower is located on the Intracoastal Waterway near J. Turner Butler Boulevard. The building exterior and spacious residences have been designed with a British West Indies indoor/outdoor style by Group 4 Design led by Karie Kovacocy and Leigh Gunn. Owners and guests will enjoy the Rooftop Oasis, featuring a conversation pool, intimate spaces for gathering and entertaining, fireplaces, outdoor kitchen, wine tasting room and private wine lockers, bar, landscaped gardens, and 360-degree views of the Intracoastal Waterway, the Atlantic Ocean, and Jacksonville’s skyline. Other unique amenities include private two-car garages for every residence, a fully-appointed guest suite, day spa, pet spa, auto spa, and a private marina with slips available for purchase. This development is not the first collaboration for Bove LLC and Remi Properties. The companies’ relationship began in 2004, building Fountain Villas in Rockledge, Florida. The relationship has remained strong through this 10-year period, and in 2013, the team completed 5 Thousand Town, a luxury apartment community at the St. Johns Town Center. Marsh Landing Country Club Realty was chosen as the exclusive brokerage for Aphora. The sales gallery is open from 10 a.m. to 5 p.m. Tuesday through Saturday and from noon to 5 p.m. on Sundays and Mondays. The office is located inside the Marina San Pablo Yacht Club at 14388 Marina San Pablo Place. Call (904) 515-5099 for more information or visit the website at www.aphoracondos.com. Aphora at Marina San Pablo is a new condominium waterfront tower unlike any other in Northeast Florida. Boutique in attitude and expansive in opportunities, Aphora offers 57 luxury homes with detailed appointments. The rooftop oasis, Hemingway Lounge and access to a spacious well-appointed clubhouse and a private marina highlight Aphora’s signature amenities. Located on the Intracoastal Waterway near J. Turner Butler Boulevard, Aphora is conveniently situated near Mayo Clinic, Downtown Jacksonville and the Beaches of Northeast Florida. For more information about Aphora at Marina San Pablo, please click here or call (904) 515-5099.